A Critical Stages & Tamarama Rock Surfers Theatre Company production CAPTURE THE FLAG by Toby Schmitz at Riversides Theatre, Parramatta. This is one of several plays by Toby Schmitz. Yes, the actor. A man of many gifted talents. CAPTURE THE FLAG is a re-mounting of the production seen at the Old Fitzroy Theatre a couple of years ago. The handsome design elements: Set design by Genevieve Dugard and Leland Kean; Costume design by Lisa Walpole; Lighting design by Luiz Pampolha (restricted by the need of a lengthy tour, I’m sure); and the Sound design by Jeremy Silver, are all revived beautifully. With the atmospheric details of the set, the addition of Mr Silver’s Sound Design must be the most detailed and technically imaginative that we have heard, over recent times (where this element of contemporary theatre-making has expanded dramatically) as a passionate contribution to the story-telling. Three of the actors, Tom Stokes, Sam O’Sullivan and Sophie Webb are new to the production. Robin Goldsworthy is re-creating his performance, in the central role, as Albert for the company. It is unfortunate that this other original performance element is the weak, if not wholly distracting part of the experience of the production in the theatre, now. Whether the habit of playing this role and/or no recent firm guidance from the Director, Toby Schmitz, has permitted this actor to ‘wring’ every emotional moment from his task, so that it is a demonstration of emotional states with no accurate story-telling content that explains the verbally overwrought and tortured soul that is Mr Goldsworthy’s Albert, is an uncomfortable puzzle. For I have no memory of Mr Goldsworthy being so over stated in the Old Fitz offer from a few years ago. Such is the performance, which inadvertently seems to draw attention to the actor’s acting, what the play is about now, is immensely distorted and hence, obfuscated. “What is this play about?”, I was asked by some audience members as we left the theatre. On the program front cover we are told that CAPTURE THE FLAG is “A play about history and our children, warfare and freewill.” Not so, at Riverside the other afternoon. It had become a play about the excruciating agonies of Robin Goldsworthy as Albert. About the actor. In contrast, Tom Stokes as Karl, the other principal protagonist in the writing, is clearly and accurately focused and gives the audience the information of the text, given circumstances and objectives, to allow us to enter creatively to endow the character and the situation with the emotional dilemmas.It is a teriffic performance. 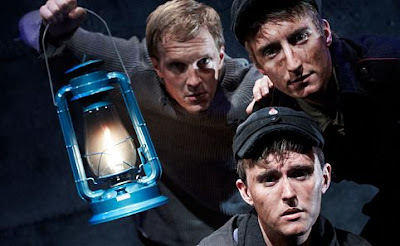 To this end the sensitive drawing of character by Sam O’Sullivan as the youngest in this dreadful trio of lost boys is also magnificent support in its accuracy and restraint. Both these actors, truly valiant in attempting to give the production balance and some truth and meaning. They almost succeed. Ms Webb as Mathilde speaks the text with some story clarity. I remember Mr Schmitz’s play at the Old Fitz with some good impression but now it is lost. The ephemeral element of live performance could not be more clearly demonstrated than here in the relative contrast and comparisons of the two productions. It is only one element, in my experience, last Saturday, that is awry, but it is central and unfortunately, catastrophically seismic in its affect on the play and the audience’s experience of it. Kevin, I posted similar comments about what I considered the dry and academic analysis of the performance of an actor in Silent Disco. No doubt what you are paid to do at NIDA but I think this does give readers a slightly misleading view of the performance by Goldsworthy and the production as a whole. Maybe it makes people decide not to go, which would be unfortunate. Not that this is by any means a comfortable night in the theatre - how could it be with the story/theme? It may be overwrought as you say, compared to his earlier performance of the same role, which you had the benefit of seeing. Why not blame Toby Scmitz who wrote/directed it and presumably let it happen?? Thanks for your loyal and interested input. I did intimate that the possible absence of the directorial eye by Mr Schmitz may be responsible for Mr Goldsworthy's work. However, it is also the responsibility of the actor to be conscious of his own instrument usage as he is the craftsman that is shaping the performance as he 'plays'. A constant objective/technical concentration needs to be employed with the subjective/emotional one in the moment of playing. Both together. 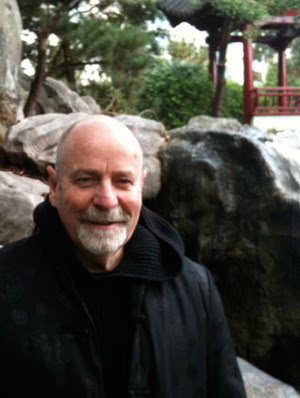 The conscious application of technique is the harnesser of the emotional life within the container of the character. This is true of the musician and dancer as well. It can, if not managed, lead to, as I felt in this performance was on the afternoon I saw it, an incomprehensible emotional outpouring with no clear textual clarity to guide me as to why the character was in that state. The play could not be apprehender. This became a performance about emotional states. An actor is a story teller not a demonstrator of emotional feelings. The text should always be primary. This is one of the tasks of the artist - this is what he strives for- a balanced contribution to the original inspiration for the choices: the writer's words. Kevin, thank you for your concise and detailed exposition of the role of the actor/performer - this is obviously where you felt Mr Goldsworthy (as distinct from the others) came "unstuck".